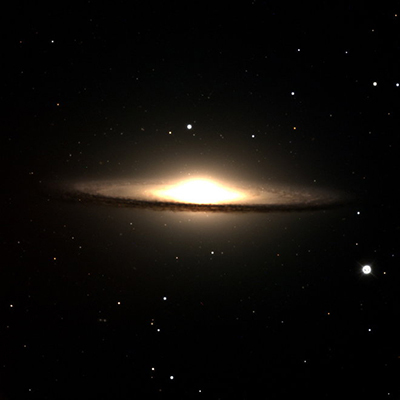 Is there a galaxy that looks like a Mexican hat? You bet. The galaxy is located in the Virgo cluster of galaxies. Spanning 50,000 light-years across, it is one the most massive objects in the Southern edge of the Virgo cluster. M104's mass is equivalent to 800 billion Suns. M104 is 28 million light-years away from us. The galaxy hosts nearly 2,000 globular clusters, which is about 10 times more than the amount of globular clusters in our own Milky Way. M104 may contain a giant black hole in its center. The galaxy's black hole is believed to be a billion times more massive than our Sun. Spitzer's full view shows that the galaxy's disk is wrapped, which likely means M104 is experiencing a gravitation pull from another galaxy. Spitzer detected infrared emissions from the galaxy's ring, as well as from its black hole. When you look at M104, you see a brilliant white core circled by a larger red disk. The inner core is a smaller disk which is tilted relative to the larger outside disk. The red region you see on the image is a bright and smooth ring of space dust circling around the galaxy. With the help of Spitzer's infrared view, we can see an otherwise hidden disk of stars within this ring of dust.